What Is the Difference Between Single Station & Double Station Smoke Detectors? With any luck, the only time you'll hear your smoke detector is when you accidentally burn popcorn or make a little too much smoke while cooking. The smoke detectors' function is self-explanatory: They detect and alert you to the presence of smoke in your home. While some smoke detectors are more sensitive than others, all of them warn occupants and hopefully prevent long-term damage, injury or death as a result of house fires. Despite their similar names, smoke detectors and smoke alarms are different things. A smoke detector makes use of a central battery or power source, which controls everything including the sound of the alarm and detection of heat or smoke. Smoke detectors usually connect to a fire control panel, but if a smoke detector goes off, occupants will still need to call 911. The fire control panel isn't in any way connected to the fire department, so it cannot automatically notify them in the event of an emergency. A smoke alarm is self-contained. This means the power source, alarm and detecting hardware are all located in or near one single device as opposed to feeding into the device from a centralized source. Smoke alarms can be either single, operating individually, or multiple station, interconnected, so when one goes off, all go off. What Is the Difference Between Single and Multiple Station Smoke Alarms? Single-station smoke alarms operate individually and typically rely on 120 VAC or 9V batteries as a power source. Multiple-station alarms, on the other hand, are all connected. 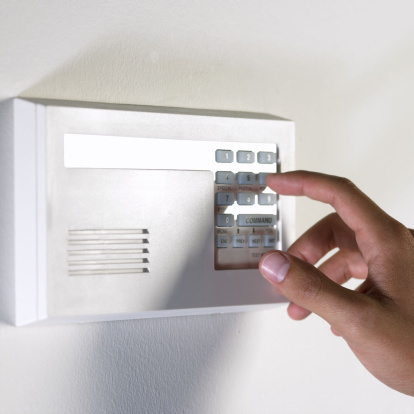 This means when one alarm is set off or tripped, all connected alarms go off. Multiple station alarms can also connect to other temperature regulating devices in the home like thermostats. Is a Smoke Alarm or a Smoke Detector Best for a Home? While smoke alarms and smoke detectors both have the same function, one may be more appropriate for a specific type of home than another. In general, smoke detectors carry about 95 percent effectiveness, when compared to the 85 to 88 percent success rate of smoke alarms. When it comes to the number of stations, multiple station smoke alarms are ultimately less expensive for homeowners as they typically have a lower upfront cost. Smoke detectors typically work more effectively because they are constantly monitored by their central alarm system. Smoke detectors are usually more useful in large settings like a hotel or office building, while a smoke alarm is more likely to be inside a home. For smoke alarms in a home, there should be one near each bedroom and on all floors of a house. Both single and multiple station fire alarms are acceptable for a home. If someone lives with more than one person or has a large home, a multiple station smoke alarm may have the best chance of notifying everyone that there may be an emergency, due to the fact that when one alarm is set off, all other alarms are set off. There is also the option of wireless smoke alarms, which communicate with each other throughout a home, without the use of hardwiring. Once a user programs and pairs the smoke alarms with one another, wireless smoke alarms will still receive the same signal and notify occupants of a home when there is a smoke threat by communicating across a network. These smoke detectors are not subject to interference from other wireless devices and many networks can hold up to 12 detectors. Please note, homeowners should test both traditional and wireless smoke detectors regularly to ensure they are in proper working order. Hopefully, a smoke detector or alarm shouldn't go beyond being a minor annoyance while cooking, or when the battery expires, leading to incessant beeping. However, emergencies do happen, and choosing the best device to signal that there is an emergency is the first step to minimizing its impact. Jorie is a Chicago-based writer with experience writing about careers, the arts and natural hair. Jorie's career writing experience includes writing for Lioness Magazine, a website for female entrepreneurs and writing the "Career Advice" article for the June 2016 issue of Cosmopolitan Magazine. What Could Cause a Wired Smoke Alarm to Go off?